A professor at the medical training college and his young student find themselves attracted to each other, although they are both married and share a good relationship with their respective wives. 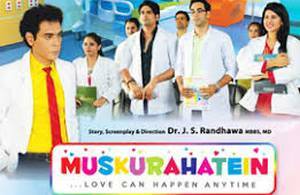 Penned down by internationally renowned radiologist Dr. Randhawa, Muskurahatein attempts to send out the message that it has become very common for married couples to indulge flings, owing to the easy modes of communications through social media. However, the situation is very critical and needs to be dealt with extreme caution. The movie gives a unique practical message that can save many marriages.